Far Cry 2 is a high-powered shooter for the PS3, Xbox 360, and PC. That's not all, apparently! According to the resume of Ubisoft's Philippe Baude, there was a version of Far Cry 2 in the works for the PSP and the Wii in late 2006 and early 2007, but the games were cancelled. Far Cry 2 was the sequel to Far Cry, which was developed by Crytek. 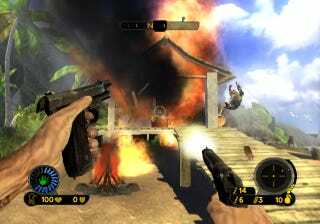 There was a Far Cry title released for the Wii, 2006's Far Cry: Vengeance (above). It looked like a dog's breakfast. Ubisoft is currently working on a new Far Cry for 2012, which is cleverly titled Far Cry 3.